The final chapter in the Asian Art Museum’s three-part Proximities exhibition leaves me with a desire to sum it all up, neat and tidy, with a bow on top. And yet, as my previous attempts to draw conclusions from Proximities 1 and 2 have taught me, this program brings up more questions and associations than it puts to rest — in the best possible way. In this iteration, artists Rebecca Bollinger, Amanda Curreri, Byron Peters, Leslie Shows, Jeffrey Augustine Songco and Imin Yeh showcase works that are mostly small samples of larger long-term projects, which mirror the glimpses we get of the massive cycle of commerce between Asia and the rest of the world. Proximities 3: Import/Export is the least romantically titled of the trio (as opposed to What Time is it There? and Knowing Me, Knowing You), but it might also be the most abstract. Direct visual references to Asia are traded for graphic renderings, slumped ceramics, process-oriented projects and conceptual exercises. Import/Export is the most ghostly of the Proximities exhibitions, perhaps because its organizing subject matter is so widespread, so intangible and yet so pervasive. Amanda Curreri presents the most colorful work in an otherwise muted exhibition. A corner of framed screenprints, two video pieces resting on kimchi pots, a dangling jump rope and an enlarged “Identity and Privilege Card” resting on a mirror shelf tell the story of Curreri’s time spent on the Yongsan Military Base in South Korea. Outside the base, a business with not one but two red, white and blue barbershop poles advertises sexual services available within. This motif recurs in prints, video and a jump rope with the same pattern of red, white and blue plastic beads. A soundtrack of ominous droning and the rhythmic slap of Curreri jumping rope are relentless — referencing a cycle of power Curreri’s work identifies and simultaneously disrupts. 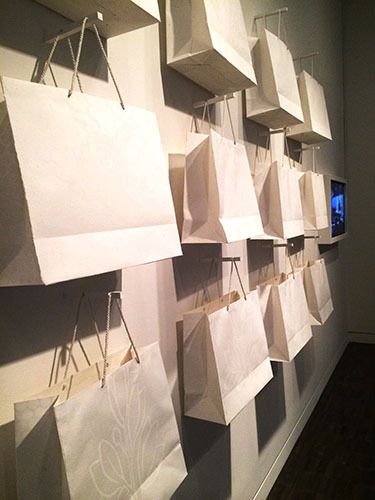 Occupying one large wall, Imin Yeh’s Paper Bag Project showcases rows of painstakingly handmade paper bags. From rags to hand-twisted cord, a video alongside the bags documents Yeh’s process. Inspired by a tour of a paper factory in Sanganeer, India, Yeh’s project makes visible the “invisible labor” responsible for objects that receive little or no recognition in our economy. In front of this installation, a single sculpture by Leslie Shows sits slumped atop a pedestal. Cantra, made of sulfur, polyurethane, tin and bismuth, references the molds used in industrial manufacturing. While a mold shapes the actual objects of desire (in this instance, car parts), Shows finds inspiration in this background element. Like Yeh, she is interested in the cycle of production and the disparity in values assigned to both raw materials and their end results. some abstract) placed alongside found items. Though she has never been to Japan, objects brought from Tokyo to Los Angeles by her father inform Bollinger’s associations with the country. The arrangements are elegant and evocative, but ultimately incredibly private — a sensation heightened by two plexi cases — one enclosing the other — furthering the remove between viewer and object, maker and consumer. Facebook likes, highlighting the intangible nature of labor, product and compensation in a digital, globalized age. Unlike the previous Proximities exhibits, which clustered around a central sculptural piece, Import/Export is spread out along the edges of the gallery. Tucked into a corner is Jeffrey Augustine Songo’s Blissed Out, a looped video of a robust young Caucasian male clad in brightly colored t-shirt and shorts. He sits cross-legged, his hands on his thighs. The goods here are name-brand athletic gear (probably manufactured in Asia), and the commodification of Eastern practices like yoga and meditation. It’s the least affecting of the bunch, but it’s nice to see another human face (alongside Curreri’s) in midst of all these big ideas. Though Proximities ends on February 23, there is no reason why there couldn’t be further installments. What about Asia seen through the lens of language, traditional craft, popular culture, appropriation, politics, sports, immigration, labor, ideology, religion, literature and film? The list could go on. 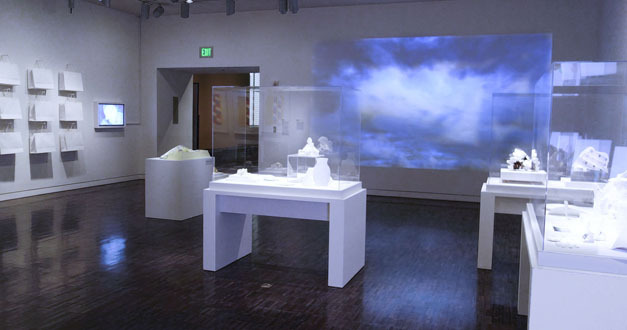 Helfand obviously needed to limit himself in the process of curating of these three shows, but Proximities’ engaging premise and thought-provoking results demonstrate that the Asian Museum could benefit by keeping it alive. Injecting new life and relevancy into the museum, both in terms of what it contains and how it reflects contemporary notions of Asia, benefits everyone. 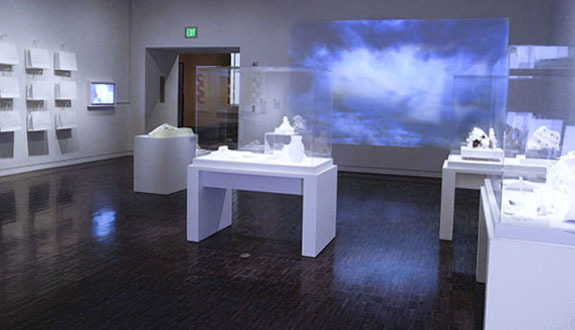 Proximities 3: Import/Export @ the Asian Art Museum through February 23, 2014.